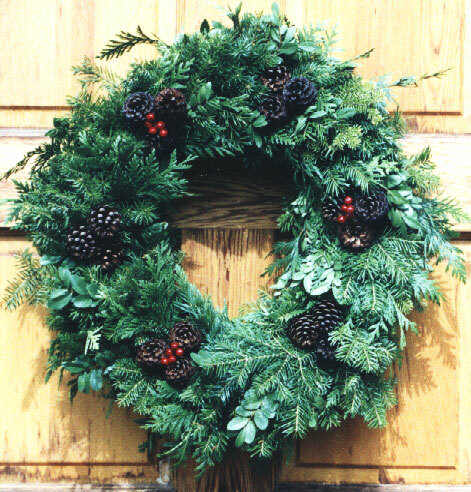 This wreath has been handcrafted from boughs of Douglas fir (Pseudotsuga menziesii) &/or subalpine fir (Abies lasiocarpa), western red cedar (Thuja plicata) and the ground cover false box (Paxistima myrsinites), when available. It is decorated with a 6 pine clusters (some with red berries) symbolising a “tracked pattern”. Variations of this wreath exist including being “wrapped” with a thin ribbon. This wreath is one of our favourites.